The above story provides the image for Emmaus, a program that calls forth and renews discipleship. It is a three-day experience that takes a New Testament look at Christianity as a lifestyle. The weekend is a highly structured weekend designed to strengthen and renew the faith of Christian people, and through them their families, congregations and the world in which they live. Emmaus is a combined effort of laity and clergy with a focus on renewing the church. 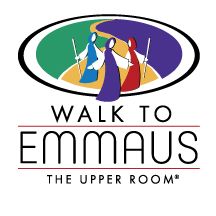 The “Walk to Emmaus” is a 72-hour experience, beginning Thursday evening and ending Sunday evening. These are busy but rewarding days.You will live together and participate in prayer, singing, worship, and group discussions of the 15 talks given by clergy and laity. The talks center around Gods grace and how it manifests itself in our daily lives. One of the primary strengths of Emmaus is the follow-up. Your weekend lasts only three days, but you are encouraged to build on it for the rest of your life. We recommend you expand your spiritual life through study, worship and action. Become more active Disciples of Christ in the world through participation in share groups and ministries of your churches. Come to the monthly gatherings to join your Christian brothers and sisters in praise and fellowship. The Emmaus movement does not exist primarily for the weekend Walks. Its purposes are to deepen the faith of individuals, to increase the faith of congregations, and to bring Christianity to the world. Who should attend an Emmaus Walk? Emmaus is a universal ministry, open to Christians from all denominations. It is designed to develop the leadership of our churches by strengthening spiritual lives and encouraging greater participation in ministry. To attend an Emmaus walk, you must be sponsored by someone who has previously attended a weekend. Your sponsor should be willing to support you after your walk by his/her encouragement, love and services. If you are interested but don’t know anyone to be your sponsor, please contact a Board Member for help. Articles of Incorporation of Darke County Area Emmaus Community, Inc.